I know exactly what you’re thinking, how on earth can someone get kicked off a cruise ship after four hours? Yet, don’t worry; I wasn’t naughty. In fact, I was actually quite grateful for my four hours onboard. You see very much out of the blue, I was contacted by CLIA (The Cruise Lines International Association) in order to take on a large mission. Explore three cruise ships in just one day. These included the Emerald Princess, Celebrity Eclipse and of course the P&O Britannia; which I’m going to talk about in this article. Rampaging the ship in just four hours, I tried to see as many areas onboard as possible. Oh, and I haven’t introduced myself! My name is Lewis Nunn and I’m a Luxury Cruise & Travel Blogger at The Luxury Traveller, Cruise Journalist, Cruise TV Presenter and Cruise Public Speaker. If you’ve ever attended a Telegraph Cruise Show, you will have likely heard one of my talks. Anyway, back to my exploration. Beginning my day at 7:30 am in Southampton, I arrived at the docks to glare up at a mammoth giant; the Britannia. This beauty caters for 3,647 passengers with 15 passenger decks and a whopping 143,730 tonnage. 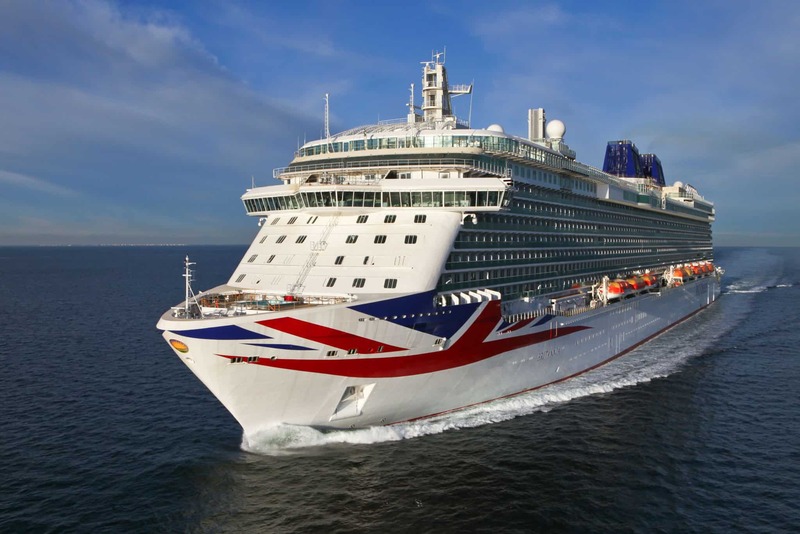 The gigantic Union Jack on the side of the hull ‘slightly’ hinted that it might be a British cruise line. Now it comes to the part of my article where I must admit something. Before attending this ship visit, I had a certain pre-judged idea about P&O. Considering I am trying to defeat the misconceptions of cruising on a daily basis, this is pretty shameful. In my mind, P&O was a very plain sort of cruise line with not much luxury to it. My first few steps onboard completely dismissed any pre-construed ideas about the cruise line. 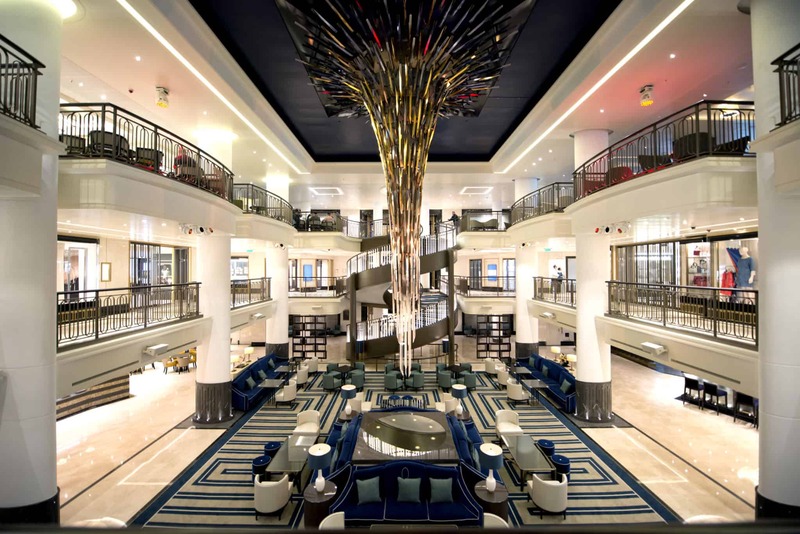 The atrium had a contemporary and sophisticated feel, spanning over three stories. 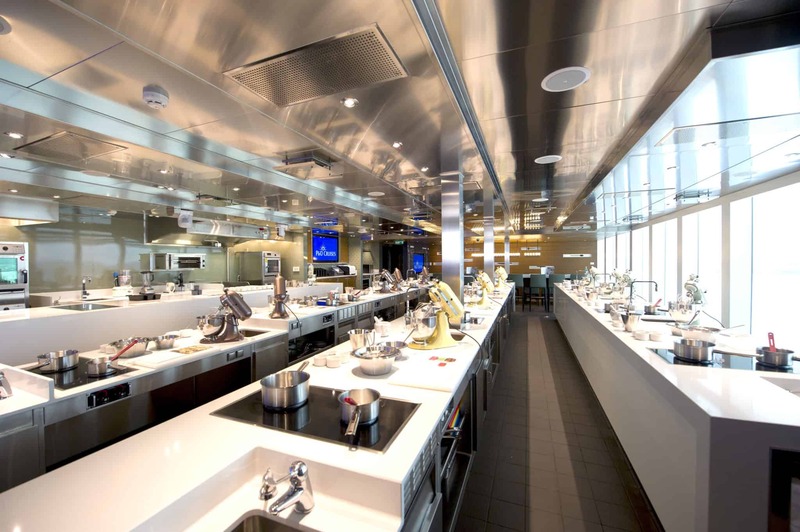 Sharply, I was taken off with excitement to the onboard Cookery Club; home too many famous chefs. Sadly I didn’t catch up with my good friend James Martin…etc. During my time here, I was able to taste one of the luscious mouth-watering brownies, pleasuring my taste buds. While circulating the ship, my tour guide stopped off at the teen’s club. In my years of cruising I have seen many different types of teen’s clubs, but never before one like this. Onboard the P&O Britannia, teenagers even have their very own dedicated deck space complete with large hot tubs and reclining deck chairs. Perfect for the times when slurping on a ‘mocktail’. 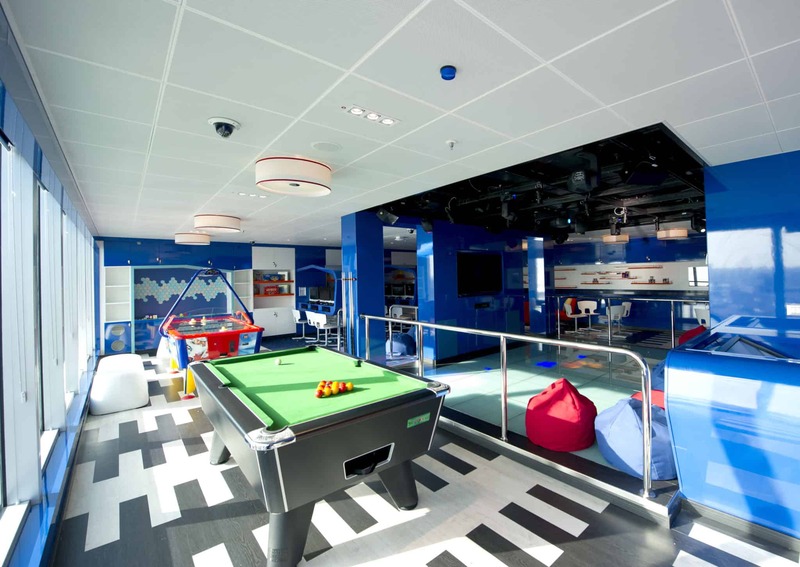 Aside from the 5* unwinding facilities prevalent here, teenagers also have access to X-Box facilities, Computers, and mini-football tables. Secret #2, I’m not sporty in the slightest bit. As a traveller, I much prefer exploring and reclining as opposed to climbing the premier league board. Though, I did ensure I had a look at the sports facilities available. Despite the prevalent idea that you may pile on the pounds at sea, there are plenty of ways to stay fit and active onboard. Inside the Sports Arena, you will find a dedicated space for Tennis, Basketball, Cricket, Football and Table Tennis. Although you probably won’t find me there often; more likely at the spa! After spending four hours venturing as much as possible around the Britannia, it was sadly time to depart. Upon reflection, my time onboard was an utter revelation. In my first few steps, I carried a misconception of mediocre and in return received 5* luxury. If you enjoyed this article and want to see some more of them, visit The Luxury Traveller. Lewis Nunn is a UK born Cruise & Travel Blogger, Magazine Journalist, TV Presenter, and Actor. Over the past sixteen years, Lewis has been ticking off many bucket list locations ranging from Africa to the Caribbean. Nonetheless, it is, of course, essential to travel in style. What better way than by cruise ship? In 2015 Lewis Nunn was selected by Norwegian Cruise Line to join a team working with multiple celebrities such as choreographer Louie Spence and television presenter Helen Skelton. From this, Lewis grasped mass media attention; and the rest is history! On the rare occasion Lewis is not working or traveling, you can find him either drinking a mocktail or taking a Cuban Salsa lesson.